I have been attending a community class which happens to be held at a local senior living community. One of the first things I see when I come in is a large, partially finished puzzle sitting on a table in a common area. Sometimes the chair by the puzzle is empty but often, there is someone sitting there, patiently looking for pieces to fit into the parts already done. And I mean patiently, as this puzzle is 500 pieces! 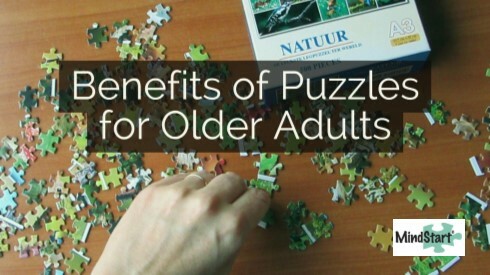 It turns out, there are many benefits to setting puzzles for older adults. Keeping the fingers flexible and strong - also known as fine motor skills - as the person picks up and manipulates the pieces to fit together. Seeing how both the image on the puzzle and how the shape of the puzzle pieces might fit together - also known as visual perceptual skills. This is a way of stimulating the mind, as the person visualizes how the pieces might fit together, tries it out, and then adjusts, as needed, to get the pieces to fit. A feeling of productivity and accomplishment! A puzzle is a very accessible activity that most anyone can do and that can give immense satisfaction when the final pieces are placed. The opportunity to try something new! When younger, people are busy with jobs and families and have limited time to spend on hobbies. In the senior years, though, most people have more flexibility in their time, so may now have the time to work fully on a puzzle for the first time! The opportunity to socialize when doing the puzzles with another person. This could be a comfortable activity to do when talking to someone new or with an old friend. It also can be a good activity for grandparents and grandchildren to do together. 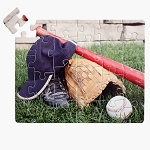 There are puzzle options in many different sizes and levels of difficulty. Most people are familiar with 50, 100, and 500 piece puzzles. But MindStart also offers large piece puzzles with less pieces and less detailed images, for people who need something simpler. 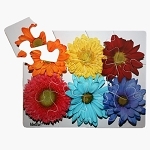 The 63, 24, and 12 piece puzzles can be ideal for someone with a cognitive or physical loss due to Alzheimer's, Parkinson's, stroke, or other condition. Choosing a puzzle that is not too hard - but not too easy - can be just the right fit., earning that joyful feeling when the last piece is put into place!